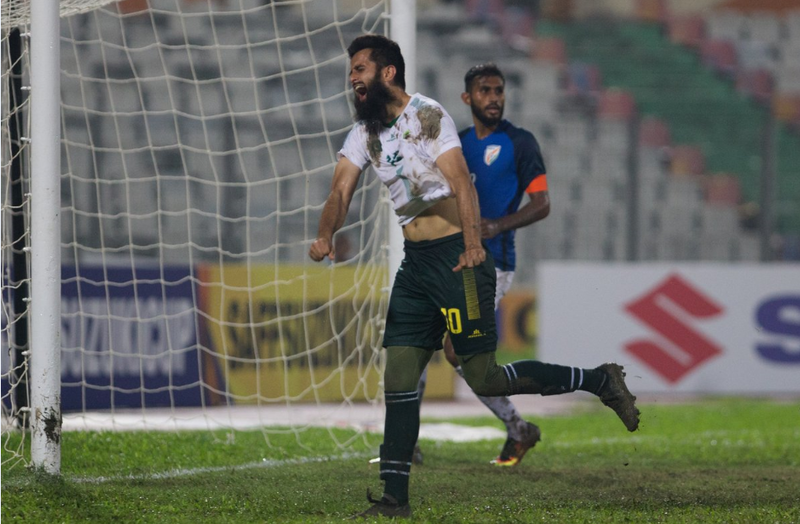 LAHORE: Arch-Rivals India and Pakistan clashed against each other after a gap of half a decade in the SAFF Championships semifinal in Dhaka on Wednesday. Defending champions India emerged the better of the two teams as they defeated Pakistan, who returned to International football after three troubled years, 3-1. Pakistan players performed well against a far higher-ranked Indian side to a goalless first half. however, their resistance ended in the 49th minute when India’s Ashique Kuruniyan delivered a low ball that was poked home by striker Manvir Singh. This was Pakistan’s first appearance in the semi-final after 13 years where they will take on India, the only unbeaten side in the competition so far. Pakistan began their campaign in the championship with a 2-1 win over Nepal in Group A. However, they lost their second group game, 1-0 to hosts Bangladesh before ending their group stage with a 3-0 win over Bhutan. Earlier on Wednesday, Pakistani cricketers had extended well wishes to the national football team.